Now that you have paid tax deducted to the account of Central Government, what if there is any inadvertent mistake while making payment such as choosing wrong assessment year, choosing wrong major head code, entering the wrong amount, wrong PAN / TAN etc and challan is already generated?. Such errors lead to no tax credit situation for the deductee. But do not panic. Tax department does understand that such clerical errors are unavoidable completely and has provided for mechanism to correct such errors. Let us understand the procedure for correction of errors in TDS challan. Challan correction can be carried out either online or offline. 1 PAN/TAN Concerned assessing officer in case of online challans. Correction is allowed only once for a single challan for a particular field. Multiple corrections of single challan of different fields are allowed. For eg: Where 1st correction request is made only for amount, a 2nd correction request will be allowed for correction in other fields. In case of non-individual taxpayers, the original authorization with seal of the non-individual taxpayer is required to be attached with the request form. 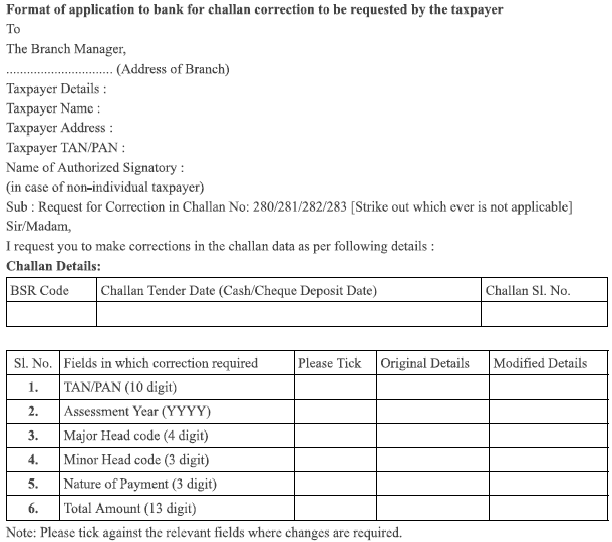 After the time limit to approach bank for challan correction expires, taxpayer can make a request for correction to the concerned assessing officer, who is authorized under the OLTAS application to make such correction in challan data in bonafide cases, to enable credit of the taxes paid, to the concerned taxpayer. Other steps are similar to approaching bank as above. Online correction of TDS challan has to be carried out on ‘TRACES’ (TDS Reconciliation Analysis and Correction Enabling System). Digital Signature is mandatory to register on TRACES for requesting online challan correction.